Gentle warm sunny ocean breezes and golden glistening sands invite you to pamper yourself with a perfect vacation at Villa del Palmar – indeed timeshare is the perfect vacation. Ranging from world class accommodations to five-star dining options and from exclusive spa experiences to the spellbinding abundance of nature in each destination; do you need more to make your timeshare at Villa del Palmar the perfect vacation? Adorning the coastline of Mexico with 5 star category Villa del Palmar properties, your Villa Group timeshare membership will leave you speechless from the moment you enter one of the Villa del Palmar timeshare resorts. You are destined to enjoy a perfect vacation, no doubt about it! To date, the Villa Group have Villa del Palmar timeshare resorts located in five different destinations across Mexico: Cancun, Cabo San Lucas, the Islands of Loreto, Riviera Nayarit and Puerto Vallarta. You may be an adventure seeker or you may be a romantic lover, whatever the purpose of your vacation at a Villa del Palmar timeshare, you’ll get more than what you expected at each and every location thanks to the exclusive Villa Group facilities and elegant accommodations. Luxurious spas, lip-smacking dining options and spacious accommodations coupled with innumerable options for exploring the tropical destinations on land and sea make your vacation a perfect one at a Villa del Palmar timeshare. In fact, Villa del Palmar resorts are perfect not only for family vacations but also as an exclusive venue for corporate team building events and romantic wedding options. In all cases, Villa del Palmar timeshare emerges as a great choice. 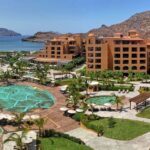 Villa del Palmar Cabo San Lucas features 460 well-appointed villas that include an extensive range of the latest amenities besides the resort’s engaging views of the ocean. Interesting slides and activities along with pampering spa facilities add a unique dimension to your perfect vacation at a Villa del Palmar timeshare. In Cancun’s Villa del Palmar, Playa Mujeres golf course happens to be the primary nearby attraction, whereas Villa del Palmar at the Islands of Loreto offers the impeccable opulence of natural riches in its marine reserve and golf course (due to open December 2014). In Puerto Vallarta, the suites are currently being renovated for a fresh new look for 2014 while Villa del Palmar Flamingos boasts a new salesroom and an award winning spa. What could possibly go wrong on vacation?